I'm happy to report we have eaten almost all vegetables and not thrown anything away. 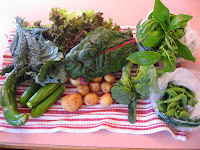 That being said, I'd better check up on the kohlrabi, kale, and Swiss chard that are still in the fridge! - Beets: actually, I had to throw this one away. I tried cooking in the microwave and burned it. My husband said several times that the kitchen smelled like a "smelly old sweat sock"....? I'm not sure who's sweat socks he's referring to. A beet farmer's, perhaps? - Kohlrabi: Have you every had kohlrabi? I've seen it in the grocery store, but never bought it. I would liken it to spicy cabbage. I've been eating it raw, just chopping it up in a salad. That's why I like belonging to a CSA. I'm willing try practically any vegetable ESPECIALLY since I already paid for it. - Potatoes: I don't normally like potatoes (wierd, I know) but farm fresh potatoes are so much better tasting. - Sugar snap peas: the kids were puzzled: "why are we having this AGAIN?" 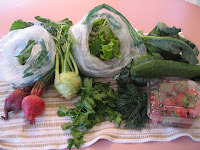 I originally thought we spend about $600/month on groceries for a family of 4. But in June, I discovered that we actually spent $774.22 on groceries alone. How do I know all of this? We've been using mint.com to keep track of our electronic transactions. It's really helped us keep track of where the money's going. It's good to have a baseline. o.k. i just read your blog this morning. your grocery bill is insane. truly insane. that must almost match the mortgage. and it's not like you are a family of overeaters. and this is why i will say, "i don't believe it!!". here is what i think is obvious and i know you agree. you need to track several months just like this and then do the average. for instance, you may have bought so much in june that in july you barely go at all. my guess is your pantry and freezer are loaded. so yes, do a three/six month average and then let's see....or better yet, a year. i want the end of year report! Wind Power...You Mean It Could Be Cheaper?